I actually stopped using a diaper pail altogether! I dry pail in a fleece and PUL wetbag (I have 2 in rotation). 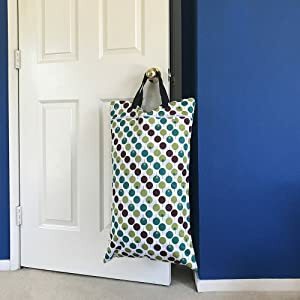 The bags coordinate with my bathroom, and I have one hanging on a robe hook in the bathroom, instead of a diaper pail. I've actually had friends ask me where I put my diapers, even after spending two days at my house and using the bathroom I store the used diapers in! I simply plop any solid poops into the toilet and throw the diapers/wipes/soiled covers into the doorknob bag. Every 2-3 days I take a wetbag down to the basement to run a load (cold wash with detergent, hot wash with no additional detergent, cold rinse) and throw the whole wetbag in with the diapers. After the first wash, I take out and hang the wetbag and my covers on the line and finish my routine and dryer the diapers. 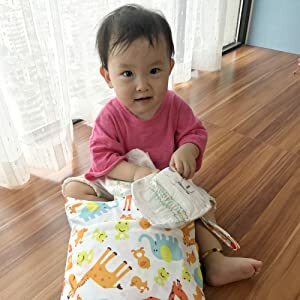 I used to use a Diaper Champ diaper pail with an Reusable Pail Liner bag as a liner... the smell was pretty intense as I had to open the whole lid to get toddler AIOs into the Champ. I was SICK of the smell and SICK of washing out the pail, so the pail-less solution has been fabulous for me!